1909 - 1944 (35 years) Has more than 200 ancestors and 14 descendants in this family tree. Claude M Roy with the 193rd Co of the CCC at Governor Brann CCC camp (NP) in Ellsworth, Maine in 2nd row in the right side of the photo underneath the down arrow. His cousin, Rosaire Morneault is in the 2nd row in the left side of the photo underneath the down arrow. [Birth record through deposition on 16 Sep 1925. Could be a reconstruction of town records destroyed by fire? or is it because when Dad needed a birth certificate, they were not able to find his record and no one remember it had been recorded as Leon?]. [name is shown as Leon with birth date on 13 June. Someone later wrote Claude over the name Leon and added né le 16 (born the 16th). Maine Birth Records also shows name as Leon but birth on 20 Jun 1909]. [Godparents were Honore Gagnon and Marie Anne Roy. Interestingly, birthdate is shown as 19 June 1909. After paying a closer attention to the original document, the date appears to be 13 June.]. [S33] Gabriel Drouin, compiler. Drouin Collection, Early U.S. French Catholic Church Records, 1695-1954 (Ancestry. Drouin Collection, Montreal, Québec, Canada: Institut Généalogique Drouin, Frenchville Baptemes 1896-1910 page 153 image 78. [S221] 1910 U.S. Census, Maine, Aroostook County. National Archives, Frenchville ED 20 Sheet 11A . [S431] 1920 U.S. Census, Maine, Aroostook County. Frenchville > District 25 > image 22. [S4] 1930 U.S. Census, Maine, Aroostook County. Frenchville > Dist-29 > image 13. 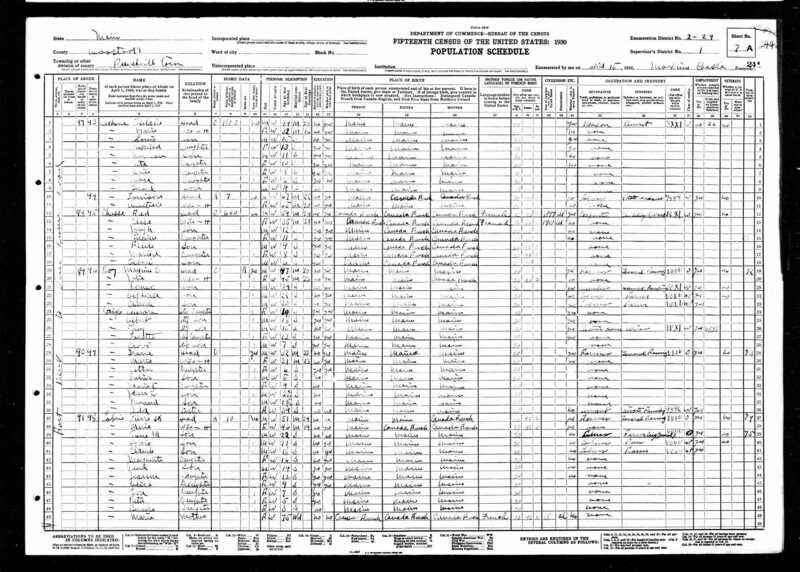 [S422] 1940 US Census, Maine, Aroostook County. Frenchville Dist 2-39 image 13. [S34] Ste Luce, Frenchville, Maine Parish Register. Burials 1944 page 214 No 18. [S104] Leon Guimond. Mariages de Frenchville, Maine (Sainte-Luce) 1843-1970. page 145. [S33] Gabriel Drouin, compiler. Drouin Collection, Early U.S. French Catholic Church Records, 1695-1954 (Ancestry. Drouin Collection, Montreal, Québec, Canada: Institut Généalogique Drouin, Frenchville Marriages 1910-1943, page 43. [License signed by Rev. A. J. Marchesseault, at Ste Anne, Bristol on 20 Nov 1941].